Post a Job on Hotshot Fitness! 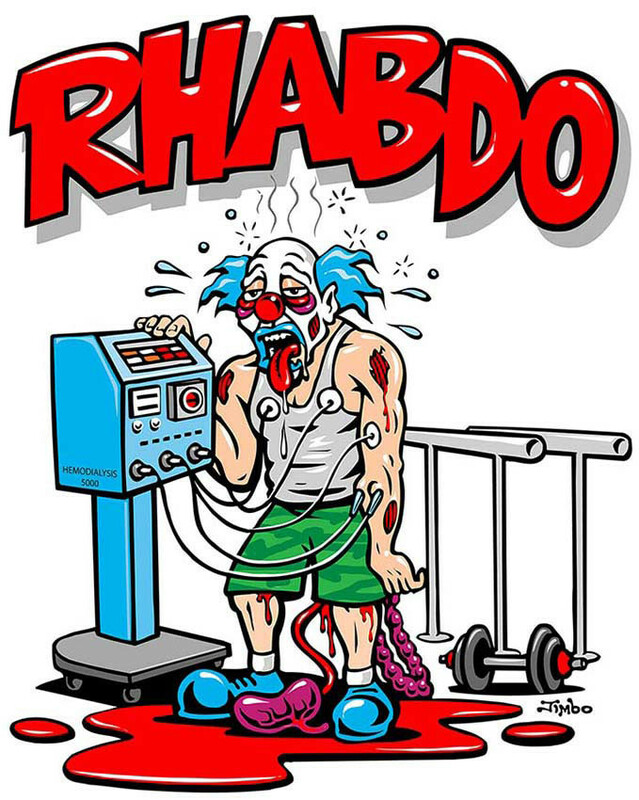 As many crews begin their season ramp up with critical refresher training, and PT tests, it’s worth taking “Six Minutes for Safety” to learn more about this nasty thing called Rhabdomyolysis, or “Rhabdo” for short. Last year we saw a disturbing spike in firefighters suffering over-exertion injuries. Specifically, over a two-month period in 2016, we saw seven reported cases of Rhabdo during PT tests, Pack tests, and crew PT. More troubling, four of those cases occurred over a four day period. Four cases were reported in May, and three were reported in June. Where Did the Incidents Occur? Takeaway: Rhabdo is not limited to one specific group of firefighters (all are at risk). Additionally, geography matters little. The cases were spread across the west about as evenly as possible. What the heck Is “Rhabdo”? Rhabdo occurs when skeletal muscle tissues are degraded to the point of disintegration, and begin to leech into your bloodstream. As your damaged muscle tissues breakdown, one of the by-products is a protein called myoglobin. As you’ll no doubt remember from your high school biology class, the kidney is working 24/7 to filter your blood. All the gunk it filters out is turned into urine. Which is why you pee. In a twenty-hour period, the average kidneys will filter around 120-150 quarts of blood and produce one to two quarts of urine. Well, as your muscle tissue is breaking down, and these myoglobins are entering your blood stream, you have a problem. Myoglobin is like Kryptonite to a kidney. The protein can cause some serious damage to the kidney, often times irreversible damage. Here’s what makes Rhabdo so nasty – you literally piss away your muscle tissue. it’s disgusting. And the long-term effects can be extremely serious, ranging from kidney failure and partial paralysis, and sadly, even death. Rhabdo is a serious threat to the health and safety of all wildland firefighters, and the most dangerous time is NOW – at the beginning of the season. Extreme muscle strain, especially in someone who is an untrained athlete; this can happen in elite athletes, too, and it can be more dangerous if there is more muscle mass to break down. So, participating in a grueling PT or training in hot environments without proper pre-training exposure. Heat stroke can be a major factor for season firefighters arriving from out-of-state, who have not allotted enough time to acclimate to their new environment. Think a new crew member from Montana who arrived the night before his first day on a crew in Arizona. First off, the person needs to be hospitalized. This isn’t one of those things where you walk the firefighter over to some shade, sit him down, and give him a gatorade and some Advil and tell him to relax. The person’s organs are beginning to shut down and without timely medical intervention, the firefighter is at serious risk. Once at the hospital, the firefighter will be given IVs of fluid to help maintain regular production of urine and prevent the kidneys from failing. And, depending on severity the case, treatment might occur in the ICU, and / or may even require surgery. The good news is that if caught early, and treated appropriately, full-recovery is quite likely. How to Prevent / Avoid It? Mental Stress has an impact. Anxiety has been linked to the onset of Rhabdo symptoms. As anyone who’s ever been the new guy on a crew can attest to, the first day, and the ensuing weeks, can be stressful. Combining physical with mental stress can exacerbate both, and lead to a heightened risk of Rhabdo. Beware of the mindset that your rookies are coming in with. Provide recovery opportunities. If firefighters are woozy, wobbly, taking knees, and struggling, it might be worth a break. If firefighters are flopping on to their backs, and struggling to hold themselves upright, or in a kneeling position look out. That’s a problem. 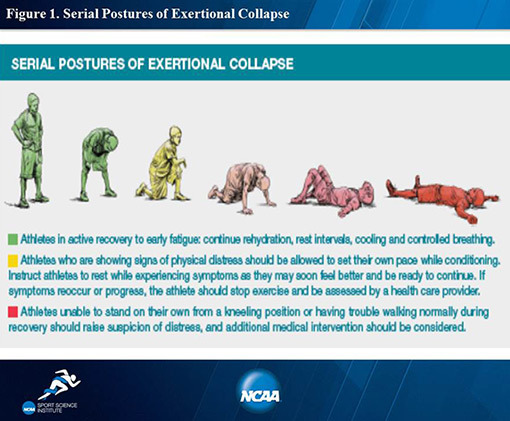 The NCAA provides a great chart showing the spectrum of recovery. Awareness. Familiarize yourself with the symptoms of Rhabdo. Have an action plan in place if someone begins to show symptoms. Better to have a false positive than a false negative. Keep these two printouts handy in the event that you need to take a crew member to seek medical treatment. Regardless of whether you’re training in Wyoming or SoCal, Rhabdo is a serious danger faced by firefighters. And it should not be written off as something that only impacts the old firedogs, or those who show up for duty in poor shape. In fact, in January 2011, a ridiculously intense pre-season workout landed 13 University of Iowa football players in the hospital, one for Rhabdo. And earlier this year, in January, a member of the University of Oregon football team was hospitalized with Rhabdo following an off-season workout. Let’s be honest – college football player are in better shape than 99% of wildland firefighters. And they’re just as susceptible to Rhabdo. Be safe out there, and take care of one another. Hey Mr. Green Fancy Pants – The Jockey #ShowEm Campaign Wants to Hear YOUR Story!